I have seen the future, and the future is...Father Tadeusz Rydzyk! 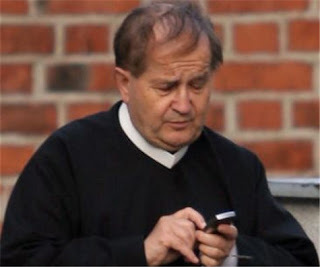 The restless, ultra conservative, media empire of the founder of Radio Maryja, TV Trwam, the newspaper Nasz Dziennik, a ‘media school’ in Torun and much more besides, is now moving where no restless, ultra conservative, media mogul has moved before: the mobile phone market! It’s a logical business move. Take the loyal audience you have - and there is no more loyal a media audience - and push a product directly at them. It's a happy coincidence, too, that much of your target audience is one of the rare demographics in Poland that doesn’t much use mobile phones - the old and/or the deeply confused about modern life. The product on offer is a pre-paid mobile phone with very big buttons, just perfect for those arthritic fingers to make a quick call to family, friends, the priest and even one of those infamous radio phone-in shows that are always on Radio Maryja, and make a quick anti-Semitic remark, or two? For more information call 720 00 77 77. Numbers beginning with a “7”, in Poland, by the way, mean you pay. So outraged are some of the more religiously minded in Poland, that they are organizing a mass pray-in to keep her out of Warsaw on August 15. She is the Material Girl who charges outrageous sums of money for concerts - the tickets here have been retailing at eye-watering prices - around 250 euro for a seated ticket. She’s a Kabbalist, exhibitionist, African baby-poacher. She is the conical - titted, self promotional genius/trickster; Nelson Mandela has been out of prison longer than the last decent song she wrote was in the charts; she can’t sing and I don’t really like her muscles. There’s lots of things you can say about Madonna. But I never thought she was Satan in ripped fishnets. Several forms of protest are being planned against the Madonna concert in Poland on 15 August, including mass prayer sessions. Religious groups are outraged that the concert is being held on a Catholic feast day celebrating the Assumption of Holy Mary. And the protestors have received the surprise support from former Solidarity leader and ex-president Lech Walesa. “It is true. I support this protest,” he told the Dziennik daily. Head of the regional Mazowieckie council, Marian Brudzynski, is coordinating two weeks of the Chaplet of the Divine Mercy prayer on the rosary and an outdoor mass at Warsaw City Hall, all in the name of blocking the pop star’s concert in the capital. Blimey! August 15 is also a national holiday - Army Day. Sounds rather secular. But this is the day, in 1920, when the Miracle of the Vistula occurred - when General Pilsudski’s men - with, so many think, a little help from the Man Upstairs - beat back Trotsky’s Red Army and saved the whole of Europe from the communist menace. President Kaczynski - not, I imagine, from Madonna’s natural fan-base - has said that there is nothing constitutionally to stop the woman from giving a concert. But Madonna - the singer - is popular here. she sold out those very expensive tickets. Easily. The battle of the Madonnas - the black one versus the white - is a delicious example of Poland’s version of the Culture Wars.